Kenstibec is a Ficial - a genetically engineered artificial life form; tough, skilled, hard to kill. Or at least he was. He's lost the nanotech that constantly repaired him. Life just got real. Just like it is for the few remaining humans in this blighted world - the Reals; locked in a fight over a ruined world with the Ficials they created to make Utopia. And now Kenstibec must take a trip to the pinnicle of our failed civilisation. The Steeple is a one thousand storey tower that looms over the wreckage of London. It is worshipped, feared and haunted by attack droids and cannibals. And the location of a secret that just might save Kenstibec's life.The only way is up. 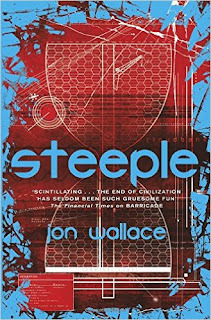 A weird and wonderful book that blends a dark dystopian science fiction with cracking characters as well as top notch prose and dialogue. Add to this a quirky sense of humour alongside plotline that really keeps you engrossed all round allows you the chance to sit back and enjoy your free time in the company of an author who knows how to wave a magical story. All round a pure joy to read and at the end of the day, whilst the second part of a series a tale that welcomes you in with open arms. I’ll be grabbing the original story at the first available opportunity. Cracking.